Normally when you hear about the French invading New York, many will quickly think of the masses of designers that descend upon the Big Apple for the city’s ritzy Fashion Week. If you’re not a fashionista and rather a historian, you might be thinking about the French and Indian War of the 1750’s — though those occurred in the upstate regions rather than within the city itself. If neither of those came to mind, it’s possible you were thinking about the weird flash-mob picnic, called the Dîner en Blanc, that popped up in NYC last August. unlike your average european club game played in the states, this one will actually count for something. But to be honest, none of those are events that this blog is really that interested in. So why then am I talking about the French invading New York? 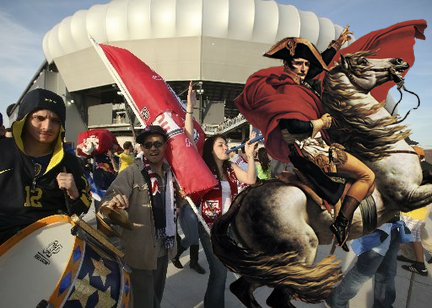 Well this summer, French football will be invading New York… well at least Harrison, New Jersey. Close enough, right? For the first time ever, a competitive French professional soccer match will be played in the United States. 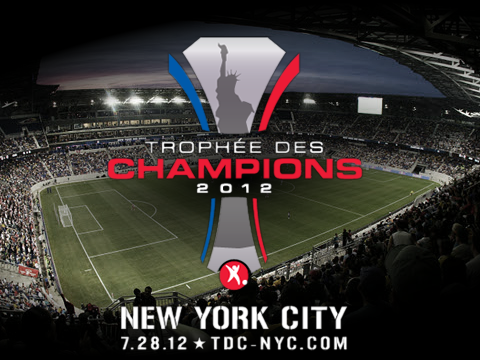 The Trophée des Champions — the French cousin to England’s Charity Shield or Spain’s Supercopa — will be hosted at Red Bull Arena on Saturday, July 28th, 2012. It just so happens to be the first major silverware awarded in the French season, so it’s kind of a big deal. And since this is the fist time it’s been held outside of a predominantly French-speaking city, much is being made of the momentous occasion. So what French sides will be leading the invasion? Facing off in the match will be last year’s Cinderella Ligue 1 champions, Montpellier HSC, who be squaring off against perennial power and Coupe de France winners, Olympique Lyonnais. Montpellier will be lead by star names such as their captain Mapou Yanga-Mbiwa, French international Olivier Giroud, and Moroccan hot-shot Younes Belhanda… assuming none of them are eventually sold between now and then. Fresh off the best season in club history, La Paillade will be fighting tooth over the summer and nail to hold on to the youngsters that helped them lift their first ever Ligue 1 title. Meanwhile, Lyon are hoping to bounce back from what they would consider to be a lousy 2012/12 campaign. Having finished fourth, their lowest finish since the 1997/98 season, Les Gones were spared further embarrassment when they barely nicked third-tier, semi-pro Quevilly in the Coupe Final 1-0. Lyon’s gauntlet of stars will include French internationals Hugo Lloris and Yoann Gourcuff, as well as internationals such as Brazil’s Michel Bastos and Argentina’s Lisandro López. how the french plan to storm the harrison, nj, stronghold is still yet to be determined. but i wouldn’t be surprised if it involved a short man on a horse. Who’s going to win? Assuming they will cash in on some of the more lauded assests, I’m guessing a depleted Montpellier side will struggle against a hungry Lyon outfit looking to redeem themselves. But as with everything in football, anything is possible bigger surprises have happened. Regardless the outcome, opportunities to watch a European match stateside that actually mean something are few and far between. And if you want to seize the opportunity and are interested in joining the French invasion in late July, be sure to peep TDC-NYC.com for tickets and additional info. And for a limited time, you can also enter to win FREE tickets to the match. Navigate your browser to the match link in the paragraph above for a chance to win 2 club seats, an all-Inclusive food and beverage package and 2 mini Adidas game balls!